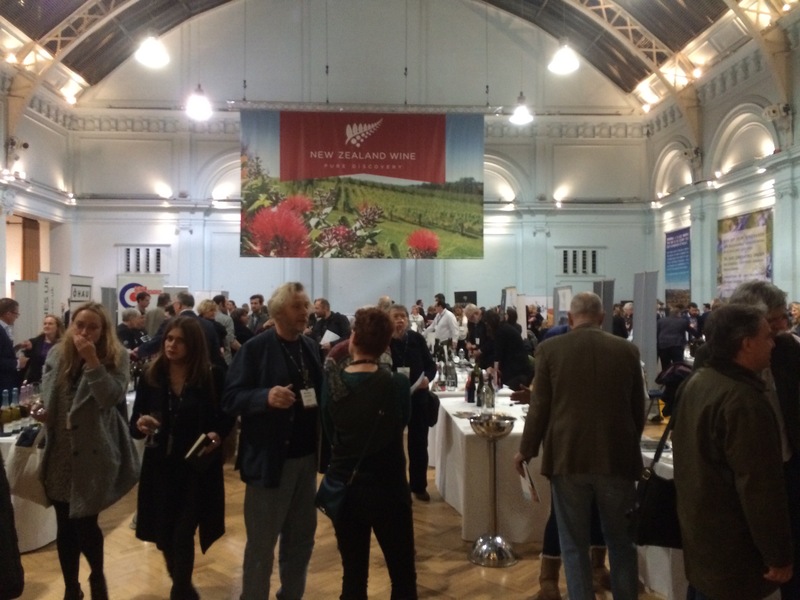 A tricky tasting with many wines appearing closed, a root day or are New Zealand’s maturing vines beginning to produce wines that behave just as capriciously in their youth as the best of the old world? New Zealand undoubtedly produces some of the worlds premium wines and what makes this all the more extraordinary is that it does so from relatively young vines and in the context of a fair bit of climatic variation from year to year. At a tasting 18 months ago to celebrate 10 years of Craggy Range Te Muna pinot noir Steve Smith MW was confident that after a decade the vines were beginning to show their full character. So in theory the wines should just get better and better, no pressure then! With 474 wines from 103 producers on show and only an hour and a half window I therefore thought the best thing to do was focus on a few old favourites to see how they were developing and what the current vintages are like. Felton Road Elms Chardonnay 2013. Crisp citrus, ripe pear, lovely texture, this wine has substance but also great freshness & good length. Delicious & great value. (No oak but aged in old barrels to soften and round it out). Felton Road Chardonnay Bannockburn 2013. A captivating succession of citrus, lemon & lime, stoney mineral notes, a whiff of white flowers and just a hint of bakery and toast. Great complexity and length, at whole lot of wine for the price. (Again more Chablis than Cote d’Or with only 8% new wood). Felton Road Block 2 Chardonnay 2013. My notes read: ‘OMG this is fantastic!’ so it was pretty good. Again citrus, ripe green apples, a good lick of minerals, very intense at this stage with great balance and long lingering finish. Thrilling and with plenty of ageing potential. Grand Cru in terms of quality, Nigel Greening founder of Felton Road believes that whilst NZ pinots are already internationally recognised the Chardonnays are now ready to sit at the top table too. Felton Road Pinot Noir Bannockburn 2013. This wine strikes a great balance between forward tasty ripe fruit and a nice vegital backbone, finishing with lashings of spice and wood. Reliably delicious. Felton Road Pinot Noir Cornish Point 2013. True to this vineyard’s character this wine is spicy, seductive and forward. Ripe red fruits, cake spices and a lush mouth feel, nice long finish. I always wonder how this will age, having started out so delicious. Felton Road Pinot Noir Calvert 2013. Again the consistent character of this vineyard comes through, quite distinct from the Cornish Point, although the clones and vinification are exactly the same. More compact with great balance, clean fruit, perfume with a nice savoury core and great length. Fantastic. One to tuck away for a few years and great value when compared with premier cru Burgundy. Felton Road Pinot Noir Block 3 2013. A lovely delicate balance of confected strawberry, cinnamon spice, real depth and complexity & great freshness and length. Felton Road Pinot Noir Block 5 2013. This has an earthy, meaty nose with ripe black cherry, intense and primary, fuller bodied with a caressing mouth feel and just enough freshness to lift the very long finish. Amazing. A great fresh gooseberry driven SB with a touch of elderflower and cracking acidity. Craggy Range Te Muna Road Vineyard Sauvignon Blanc, Martinborough. This has more substance, stone fruit and a nice creaminess, but still all the crisp freshness that you would hope for, very satisfying. Craggy Range Chardonnay Kidnappers Vineyard. Hawke’s Bay 2012. Vibrant ripe citrus, touch of honey and a lovely saline whiff of the sea shore. Great balance and freshness, the tiny touch of oak very subtle. Craggy Range Pinot Noir Te Muna Road vineyard, Martinborough. 2012. This seemed a little closed down and I have noticed that although they start open and inviting MZ some PNs seem to close down and become more reticent after a couple of years. Red fruit and a vegital base, good balance and nice finish. This is normally a real crowd pleaser with pure fruit and a heady floral perfume as evidenced by our 10 year tasting finishing with the 2011 two years ago. Craggy Range Pinot Noir Aroha Te Muna Road vineyard, Martinborough. 2011. A selection from the finest parcels with some whole bunch fermentation. Quite primal with earthy, vegital with black cherries wood and smoke, you can almost taste the stalk tannin which may need a bit of time to fully integrate. Again quite closed but with plenty of substance. Craggy Range Syrah Gimblett Gravels, Hawke’s Bay. 2011. Black and white pepper, tight black fruit, quite austere at the moment , medium body with good balance, will hopefully fill out with time. Craggy Range ‘ Le Sol’ Gimblett Gravels, Hawke’s Bay. 2011. Again quite closed overall but clearly an intense wine with a deep core of black fruit, black pepper and toast. Great balance and long length. Craggy Range ‘Sophia’ Gimblett Gravels, Hawke’s Bay. 2011. Gorgeous polished nose, perfumed wood polish, ripe blackberries, medium body, fine tannins, silky mouth feel and good length. Delicious. Categories: Everything else, tasting notes | Tags: chardonnay, Craggy Range, Felton Road, New Zealand, pinot noir, sauvignon blanc | Permalink.